FalconBoards are a revolutionary system designed to quickly set, quickly adjust, and quickly form your flatwork. Use on everything from driveways, footings, sidewalks & walkways to patios & stairs, foundations & slabs, tilt-up slabs & wall panels. Our high-quality urethane stamps come in a variety of patterns to add interest to any of your flatwork projects. 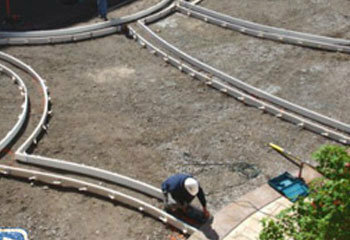 Learn more about how our products can be used on your flatwork projects. Check out our Youtube channel. 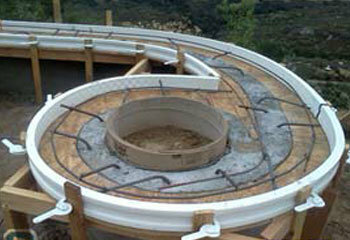 Forming concrete with plastic forms is an easy way to do curved radius patios, walkways, and other concrete slabs. 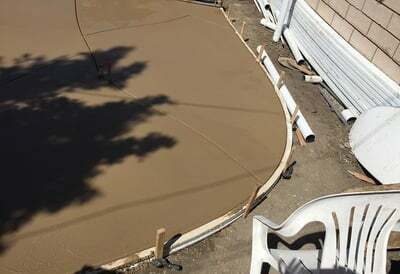 See this demo of plastic concrete forms being used and get tips on using them to form concrete. Our customer support staff is here to meet all phases of your project needs while our engineering staff is devoted to anticipating your future flatwork requirements through continual product improvements and expansion. And when your project goes beyond the scope of flatwork and into vertical forming, our parent company, Spec Formliners, Inc. is here for you, too. Watch Spec's Video. Savings on Labor Setting up Falcon SpeedForms™ is up to 4 times faster than wood, especially when curves are involved, and grade adjustments are lightning fast. Long-Term Savings on Materials Falcon SpeedForms™ are reusable dozens to hundreds of times with proper care. Easy Clean-Up Forget form release with its oily mess and spills: concrete won’t stick to Falcon SpeedForms™. Hidden Savings and Benefits Falcon SpeedForms™ are lighter than wood, less expensive to transport, easier to carry on the jobsite, with less likelihood of injury from carrying heavy, oily, waterlogged wooden boards.